Earlier this year, L’Occitane launched a new line of perfumes — La Collection de Grasse; the collection started off with four fragrances and now has doubled in size.1 I’ve only had the chance to spend quality time with two of the perfumes: Fleur d’Or & Acacia and Ambre & Santal. Fleur d’Or & Acacia begins with, and maintains, an intense acacia-mimosa accord; and at first, this accord smells genuine (natural). The lemon note in Fleur d’Or & Acacia’s opening serves as a momentary “booster” for the florals. After Fleur d’Or & Acacia’s authentic-smelling acacia-mimosa notes vanish, and that happens quickly, they are replaced by acacia-mimosa 'chemicals' that soar into space, and up through my nasal passages. Fleur d’Or & Acacia’s floral notes change from "pure" to modified; the effect is similar to finding a beautiful acorn or piece of driftwood and spray painting it gold with inexpensive enamel. 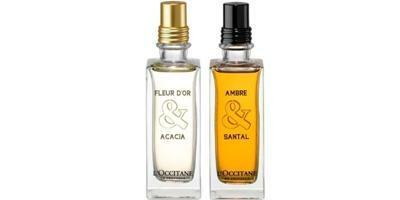 I had much better luck with Ambre & Santal, a lovely, gentle and almost-smooth amber perfume. I usually love my ambers roughened up with oud or pungent herbs, but I had an immediate bond with Ambre & Santal’s more demure ways. The amber accord is comprised of the usual components: labdanum, vanilla and woods (though don’t expect to detect any of that “santal” as you sniff Ambre & Santal …quiet cedar is more like it). Ambre & Santal goes on with a bubbly bergamot note and, if you strain, you may detect rose, too. What’s wonderful about Ambre & Santal is its dry down, where fig and rose, and maybe a mystery ingredient, produce an edible aroma. I was wondering as I wore Ambre & Santal how I could make a subtle amber jam for Christmas gift giving, maybe using plums, rose petals and amber-scented tea as a “base.” The jam-y element gives Ambre & Santal the originality Fleur d’Or & Acacia lacks. Since I'm amber-less at the moment, I may buy a bottle of Ambre & Santal. L'Occitane Fleur d’Or & Acacia and Ambre & Santal (both by perfumer Karine Dubreuil) are available in 75 ml Eau de Toilette, $75. 1. In addition to the two reviewed today, the line now includes Jasmin & Bergamote, Magnolia & Mûre, Vanille & Narcisse, Thé Vert & Bigarade, Rose & Osmanthus and Cèdre & Oranger. A good lunchtime laugh! Thank you, Kevin. Generally, when aroma-chemicals blaze a trail through your nasal passages on their way to space, you can bet that the florals have been boosted with iso e super. “White woods” in the list of notes is another give away. Your reaction is exactly like mine is to it. Amberless?!? I’ve been wearing SSS Amber Noir lately and luuurrrve it! I highly recommend your trying it. And if you’d like a sample, email me at rappleyea11 at yahoo dot com. I must return the enabling favor! Rappleyea…that is kind of you…but I’ve smelled the Ambre Noir already…I just can’t make up my mind which amber to buy! And it is TIME for amber…freezing here. Perfume isn’t an either/or is it? Buy them all!! Another favorite of mine is the PdE Amber Rouge. No way, Rappleyea…this man is CUTTING BACK on perfume purchases till my current stock dwindles. But I DO need an amber scent…. I also love the SSS Ambre Noir and plan to buy a full bottle as soon as the shopping cart is back up on their website. The Ambre Noir and SL Ambre Sultan are my current favorite ambers. Bastet…you can’t go wrong with Ambre Sultan, that’s for sure. I tried the Acacia this weekend and found it pleasant enough. A good office scent. I had a quick spritz and didn’t pay enough attention to how it evolved. I want to try the body oil because I like to try anything in a body oil. Juicejones…they would KILL me if I wore it to the office…it is outrageously powerful on me. Merlin, weeeeeeell…I do like this one, and Parfum d’Empire Ambre Russe has grown on me…I like it better each time I smell it. Who knows?! I think it was a base notes poll that voted Ambre Russe, Ambre Sultane and Ambre Precieux as the top three ambers: the second is a little too bitter for me though, and by the time I sampled the third I had utterly out-ambered myself! Ambre & Santale sounds lovely and I will definitely try it when it arrives here (we have only just received the first 3 from this series). Are you familiar with Eau de Beaux, and if so, how would you compare them? Merlin: I sampled Eau des Baux a long time ago…but I remember liking it…I remember it being stronger than Ambre & Santal but not similar in scent…maybe sweeter. L’Occitane has gotten overpriced for most of what they offer, with some exceptions. They are Yves Rocher with a $25 markup. Dampier…some of their perfumes are certainly overpriced…but what ISN’T overpriced in perfumes and toiletries these days? Don’t get me started on candles! Ha! Don’t get me started on candles either! It’s absolutely nuts what they charge! I had the same response on these two as you did. I don’t particularly like amber but the SA, also not a fan, was surprised at how nice this one is, and I agree. It’s not an amber-amber, and interesting about the fig leaf as I love fig leaf and need to explore this more for that note. Floragal: You’re welcome! Why aren’t there discounters for great candles!? HA! Had the exact same experience with Fleur d’Or & Acacia…had to scrub it off after an hour or so. Didn’t think one of the L’Occitanes would be so tenacious (and synthetic). Galbanumgal…no longer that quaint ‘little’ Company from Provence! I waltzed through my local L’Occitane about two weekends ago and tried these two as well as the Magnolia and the Narcissus from the first group launched in this series (I’ve been behind). I actually found the “Fleur d’Or & Mimosa” to be not too bad, and certainly not a scrubber, but I’m sure I liked the Notre Flor Mimosa de l’Esterel much more, though it was fairly linear. But “outrageously powerful”? I only tested one spray on skin, but it’s hard to imagine it being so strong on you. Interesting. However, I would have bought a bar of Ambre & Santal *soap* on the spot … if it existed! The SA said, “Oh, soap was only made for the other two news scents but maybe one will be produced later.” Isn’t that always how it is? I just checked the website and bar soap is available for all six of the other “Collection de Grasse” scents. Weird. Why? I guess I could do the shower gel, but I’ve been really into bar soap lately. Sandalwood soaps are so delicious too — luckily, I have a couple other favorites, including Tam Dao soap. Joe: must remember to sniff the Mimosa de L’Estérel … I prefer my mimosas powdery so may like it better than syrupy Fleur d’Or. Fleur d’Or & Acacia explodes on me…and many others. Even the L’Occitan SAs said: “DON’T SPRAY TOO MUCH!” HA! I think they were thinking of their own noses, and health, as well as mine. Ambre & Santal was nice but the perfume is overpriced. I did the next best thing by getting the shower gel. Fleur d’Or Acacia was a watered down honey and chemical soup mess – describing it as disgusting is giving it too much credit. Yuck. I really looked forward to trying Vanille & Narcisse, but was so disappointed. I can’t even really begin to describe it! Don’t think I’ve tried this line. I love amber, love sandalwood. Hope to get a sample of that one at some point. Nearly completely OT, but your mention of Amber jam notions reminds me of one of my all-time favorite jam recipes–Peach lavender! I make a lavender infusion that I cook the peaches in, and it gives it the wonderful “essence of summerness” to me! That sounds super good, please send jam this way!:D. I have never attempted to make a jam…I just like to eat it:). Sadly, I don’t have any more in my pantry right now, or I’d be tempted to send you some! It truly is nummy! Jam isn’t hard–one of the easiest things to can, actually, since it’s easy to get the sugar/acid balance right for good taste and safe preserving. And it’s easy to eat!